Every man needs a few pairs of great dress shoes for the unavoidable modern battle suit, that brings you from office boardroom to after work party. Most men are best served by having one or two pairs of classic, timeless dress shoes with a Blake stitched welt. Along with those two pairs, a man is ready as a working professional ready to conquer the corporate ladder. Commonly referred to as one of the most elegant types of men’s shoes, the Oxford, unlike its Derby counter part, if meant for more formal occasion, whereas Derby is easier to wear. A good pair of formal men dress shoes is sewn, ready than glued (cemented), meaning the leather upper is stitched to the rest of the shoe. The soles of well-made shoes will be stitched, not glued, to the bottom of the shoes, as glue greatly affects the durability and shelf life of a leather shoes. Carl & OAK Bespoke Shoemakers is a Singaporean company of shoemakers specializing in high quality formal dress shoes for men. 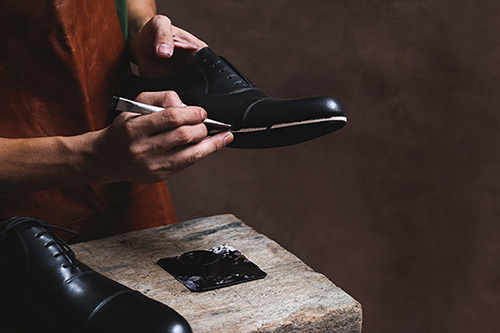 Our exceptionally beautiful range of CustomMade leather shoes are meticulously handmade by master craftsmen and exclusively brought to you by The Carl & OAK Singapore. Shop online for Men’s Hand Stitched tailored dress Shoes at Carl & OAK Singapore. Free Local Shipping on all orders.